In 1982 The GolfWorks was 6 years old and we were setting up distributors around the world. A new distributor we had just put on was Diamond Golf located in England. Diamond Golf covered the British Isles and much of Europe and Spain. They sold our clubheads, tools, books, some shafts and grips and other general supplies. Some of the products we carried were also available in their market so they were sourced by them. 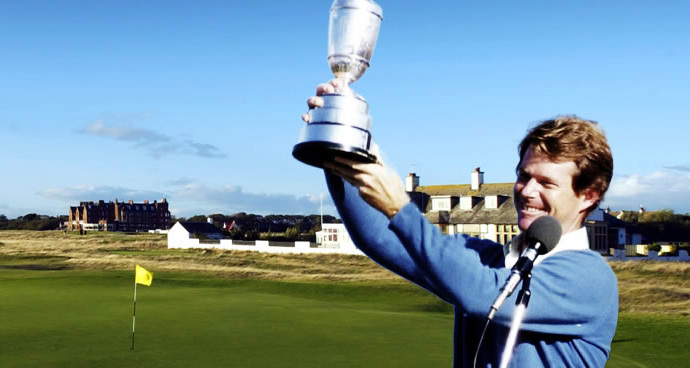 If you have never attended it, the British Open atmosphere and physical surroundings are very different than golf tournaments in the United States. it’s more like a giant golf products and golf services show for the public that just happens to be held at the same time as the golf tournament. Huge tents are set up for the vendors to display their wares and just about everyone from the golf business shows up from the local ladies gold motif hand bag seller to the largest golf club company in the world. I was asked to come over and do some short speaking segments to the groups that gathered around our booth at specific posted times and also to be available to autograph my two latest books. I brought my wife, my oldest daughter Tracy who was 16 years old at the time and a GolfWorks employee to help me with the training and sell stuff. We all stayed at a bed and breakfast in Ayr, Scotland about 8 miles away from the tournament. The woman who owned the bed and breakfast was wonderful and provided a great breakfast every morning. However, to this day I do not have the foggiest idea of anything she said to us. Her accent was so strongly old Scottish that I never recognized it as some form of the English language. Diamond Golf had rented a rather large booth space in the middle of one of the tents. They constructed a platform over the entire space about 2 feet off the floor. The idea was to set up a golf club repair and assembly operations on the outside of the stage and do instructional demonstrations during each of the days. It was thought that more people could gather around and see the demonstrations better and it worked out really well. The public could also walk up a couple stairs, come into the booth and look over the products for sale. I had previously shipped over a rather large supply of the two books I had written and as it turned out I autographed every single one of these books and we also went through every book our distributor had in stock. It was overwhelming and gratifying and a great way to kick off the relationship with a new distributor. The tents were always packed with people and it was not uncommon to see any number of the tournament players come through and check things out. However, this mostly occurred on the days before the start of the tournament on Thursday. Well, it was now Saturday, rather late in the afternoon and everyone was quite aware that Tom Watson was leading after the third round. 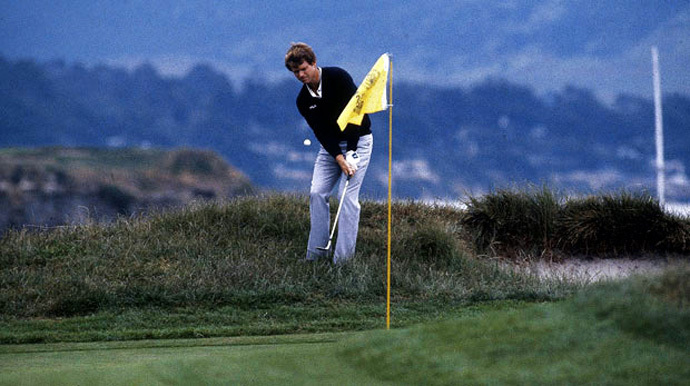 I think Nick Price was only one or two shots behind in second. I was standing up on the stage of our booth when I noticed at the other end of the tent a rather large swarm of people moving in our direction. It must have been 75 to 100 people at least judging by the size of the group. There also seemed to be a leader out in front that the group was following. They were coming closer and closer and straight at our booth. Finally as they were getting quite close I saw Tom Watson leading the pack and he appeared to be carrying a single golf club. 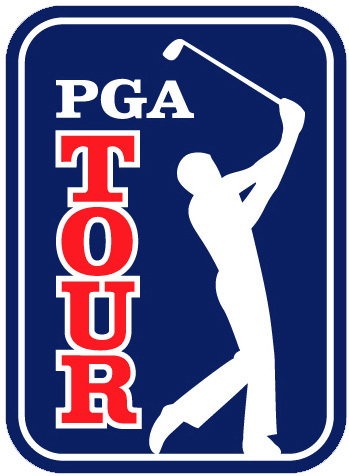 I had known Tom from a few years prior because he had to attend a tour school I spoke at that was put on by the PGA at various U.S. tournaments so the players could achieve PGA membership status. 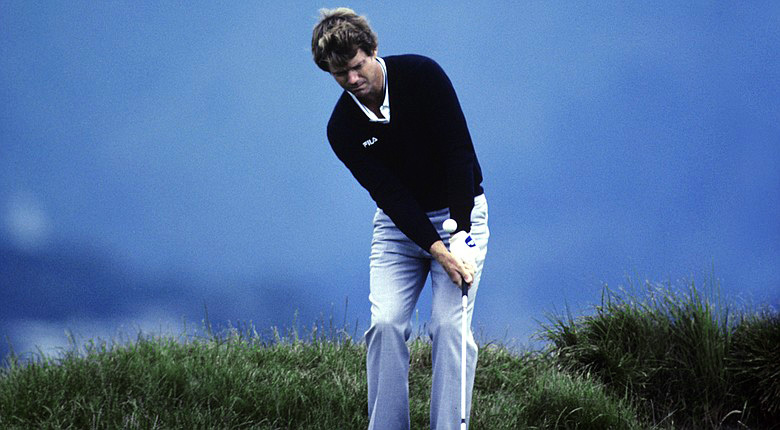 Tom Watson ordered a GolfWorks loft and lie bending machine and a couple other gauges for his shop back home. Tom waved to me and proceeded up the stairs to apparently talk with me. he had just finished the third round and on the 17th hole the head on his #6 iron flew off the shaft and went quite far down the fairway. He still managed to par the hole. After he met with the press briefly to fill them in on what happened, he headed off to find me. All he told me was that one of the officials told him that he saw me in one of the tents and he decided that no one was going to fix this club but me. Okay, here is how it went. First of all I now had at least 150 people gathered around our booth trying to get a glimpse of Tom Watson and trying to figure out why he was there. I took the club from him and looked over it closely. I then slipped the shaft back into the hosel to see if I could troubleshoot any additional problems. Well as bad luck would have it the shaft dropped right in and wobbled front to back and side to side. I asked Tom about this and he told me the person that reshafted his irons needed to bore or ream out the hosel holes to get the shafts to fit. Obviously the person doing this really messed up the hosels and over bored the hosel way too much. I cleaned all the remaining epoxy out of the hosel hole and cleaned up the tip of the shaft so the new epoxy would bond well. Here is problem number two. We could not ship into England the epoxies that we sold in the U.S. so our new distributor had to source them locally. I had never used this new epoxy and when I mixed it, it actually felt a little weird in consistency making me additionally nervous. Remember, Tom had to tee off around noon the next day so I was not only praying for the epoxy to fully cure but also hoping that this brand epoxy had a very high yield strength and also that it did not cure up too brittle. At this precise moment in my life I felt it was definitely a curse to have this much knowledge about how different epoxies either worked or didn’t work in golf club construction. I cut out a thin brass rectangle from the large sheet we sell to act as a hosel shim in situations such as this. I put epoxy on everything, the shim, the shaft and down inside the hosel. The shaft was inserted but the shaft still rotated in the hosel. It did not wobble so I successfully solved the problem of any possibility of altering either the loft or the lie angle. The fact that it could still be rotated in the hosel was solved by wrapping a rather large and ugly amount of masking tape simultaneously around the shaft and the hosel. Now it could not rotate so I checked the grip alignment one last time to be sure the shaft was in the correct position. I talked with Tom and explained that this was not an epoxy that I had previously used and to be sure in the morning to grab the grip end of the club in one hand and the head end in the other and try to twist them apart. If he could not do this, everything should be all right. Tom wanted to continue talking and asked me a number of club-related questions. He asked about a number of our tools in the booth and he decided to order our loft and lie bending machine and a couple other gauges for his shop back home. We also agreed to swap signed books when we returned back to the U.S. which was a rather neat idea of his. My wife will verify that I could not sleep that night. I was quite nervous. I figured that my career in golf could be very short-lived if the head flew off the next day. 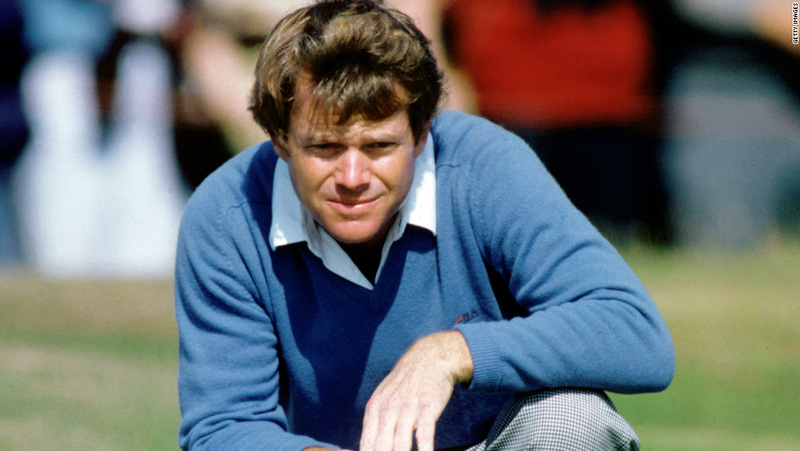 Why did Tom Watson have to be leading the British Open? 75th place and the press could care less if a golf club head flew off coming down the 18th fairway. I actually thought of this. The 18th at Royal Troon was a par 4 and it just so happened that in the era Tom would drive the ball and have about 165 to 180 yards to the hole. He just could possibly end up with a #6 iron to the green to win the British Open. Well, Tom Watson won the British Open, the head stayed on and my reputation and career were saved. Life is good.